A bullwhip is the preferred whip by stockmen and whipcrackers in the US and UK, but in Australia is very rarely used. Down the bottom of this page you can view different ones that I have made. 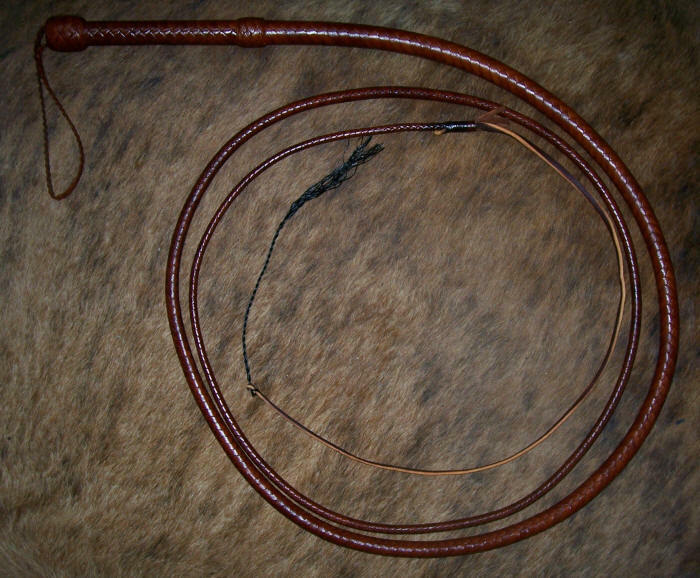 My bullwhips have 2 plaited bellys and are lightly shot loaded. 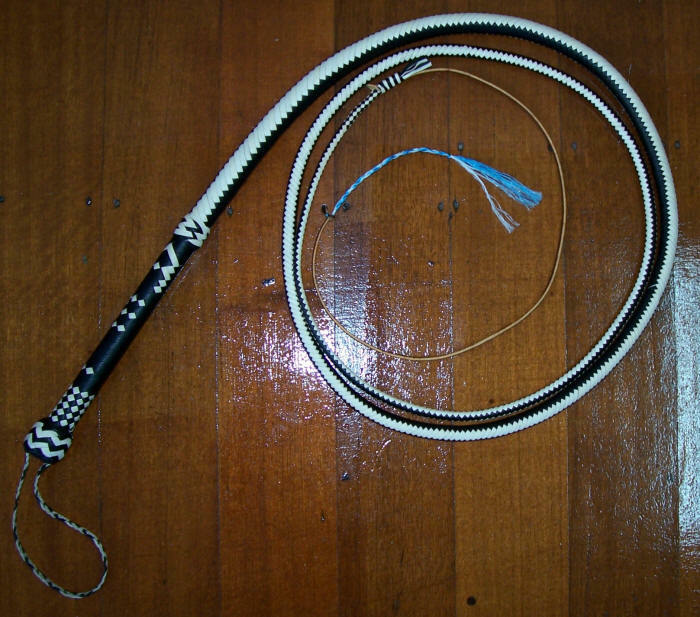 I make two styles of bullwhip the traditional style and the Indy Styles. 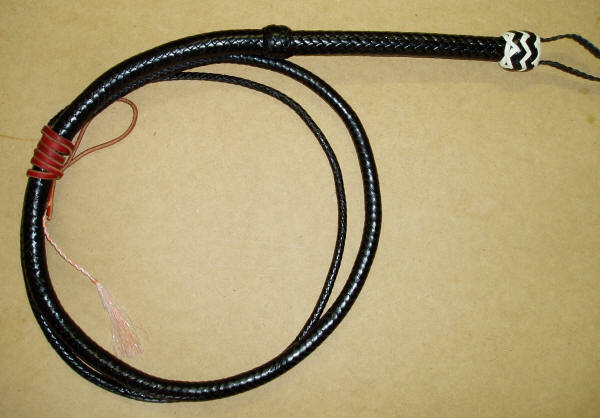 I can make any length whip and amount of strands you want. Just get in contact with me and I will give you a price if it is not here. 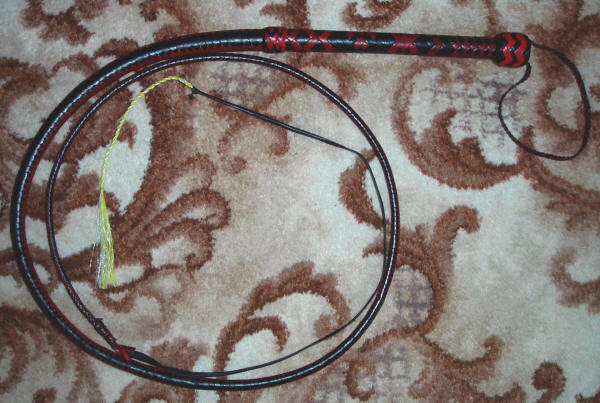 Anything above 20 plait in a bullwhip is classed as a collectors item. 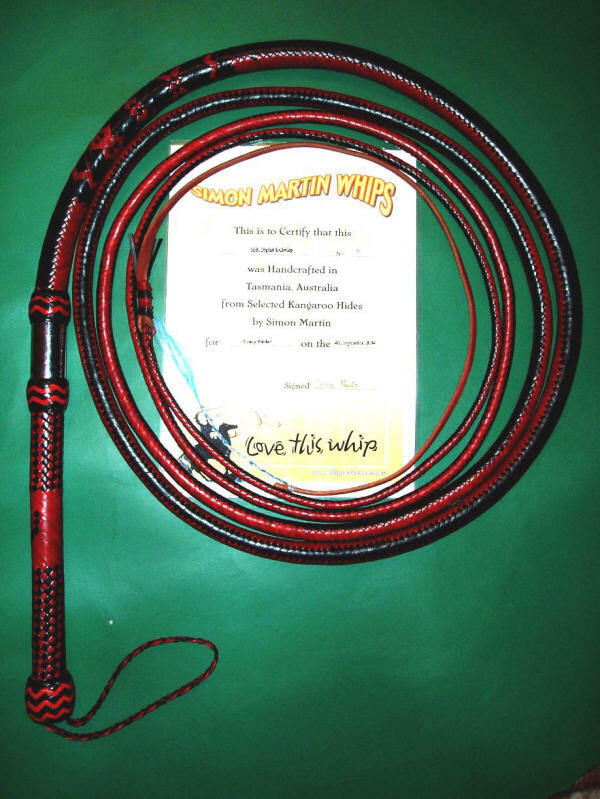 My whips are used and recommended by World Whipcracking Champion, Ben Hughes and many other well know whipcrackers. Two tone is an extra cost of $40.00. 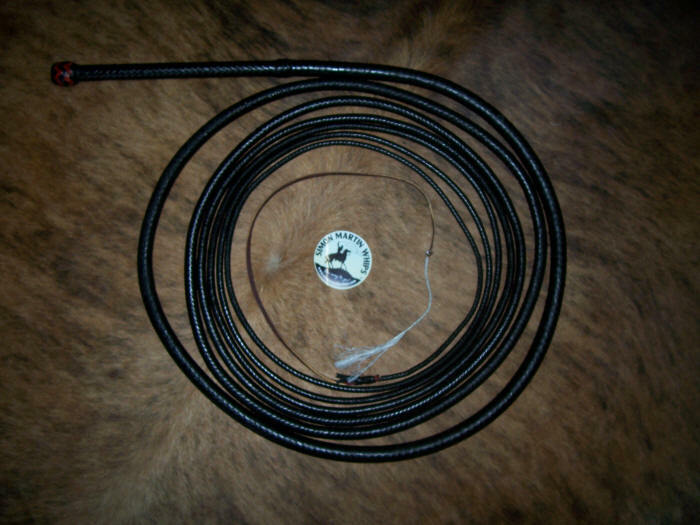 A certificate of Authenticity is an extra $10.00 and a Brass or Stainless Steel Ferrule on the handle $80.00. 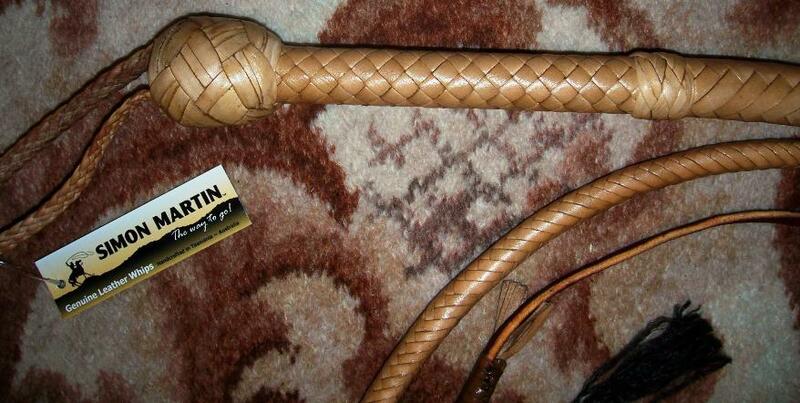 Initials can be plaited in the handle in two tone at no extra cost. Also see Colours. To order go to ordering. If you just have a general question feel free to email me. 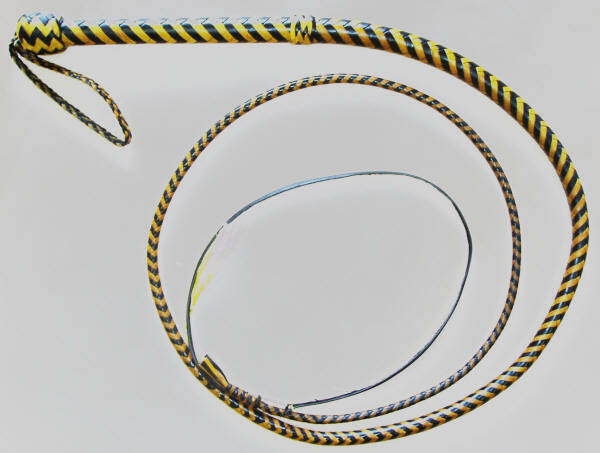 See Matched Pairs for a set of Competition Whips. 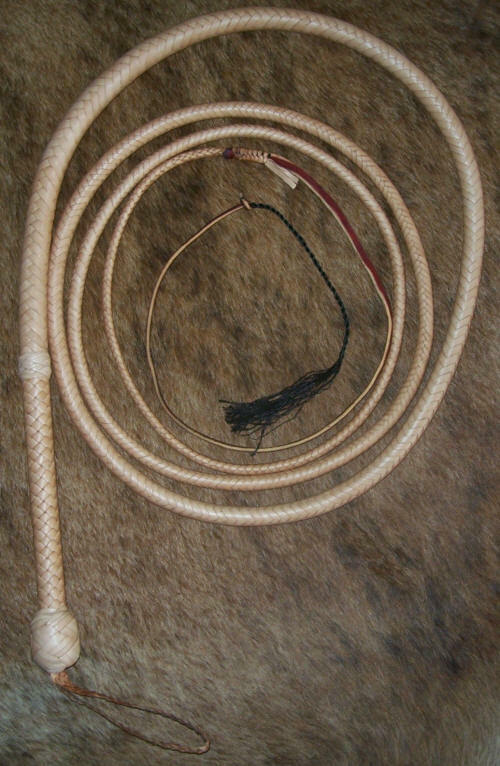 All my bullwhips are numbered from No.1 onward with a brass pin in the knob which shows the number of the whip and my name. 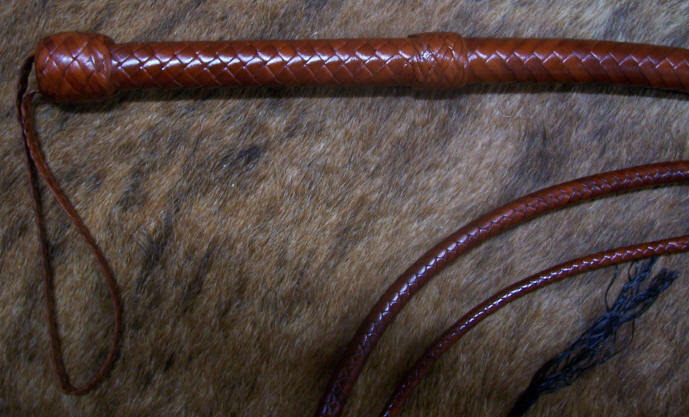 Kangaroo Hide Bullwhip. 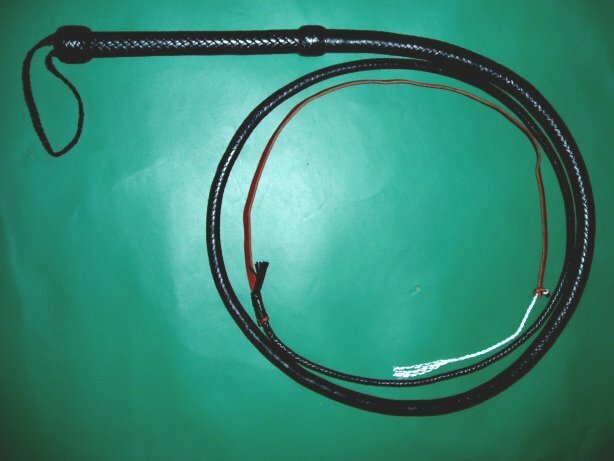 12plait Handle (Picture example only) *Handle length is generally 10 inches but will vary depending on the length of whip you order. 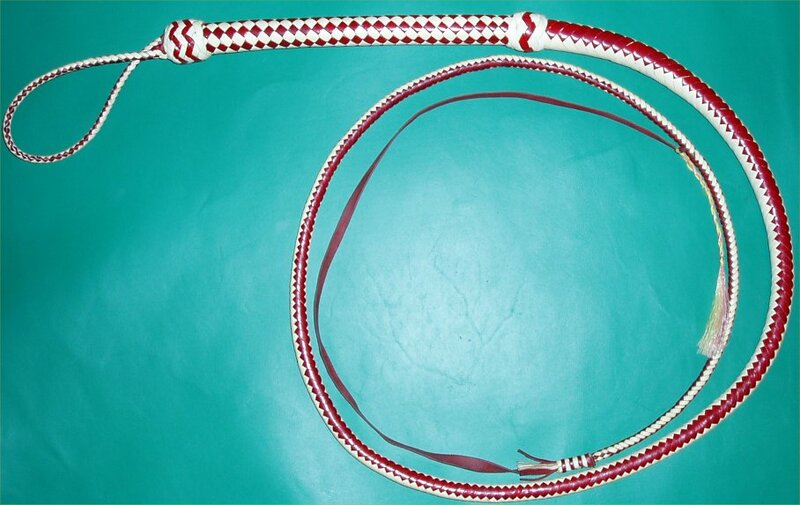 Kangaroo Hide Snakewhip 16plait (pictured in 2 colours) *Handle length is generally 10 inches but will very depending on the length of whip you order. 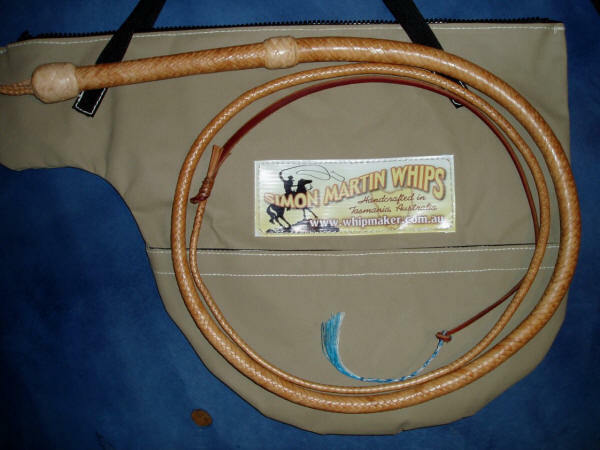 The Indy bullwhip is made in the same way as the traditional bullwhip except it has an eight inch handle that is slightly thinner. Also it has different shaped knots. 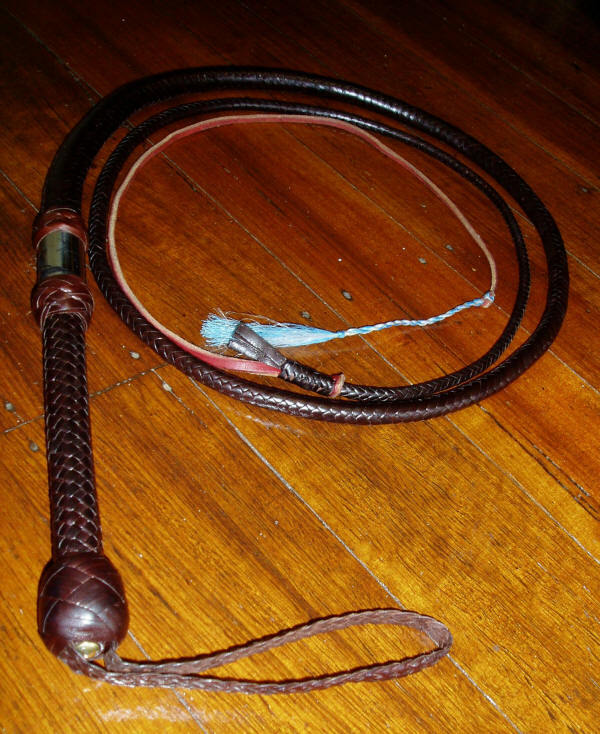 This whip is a replica of the whips used in the first 3 Indiana Jones Movies. If you are a fan I am sure you will want one of these. 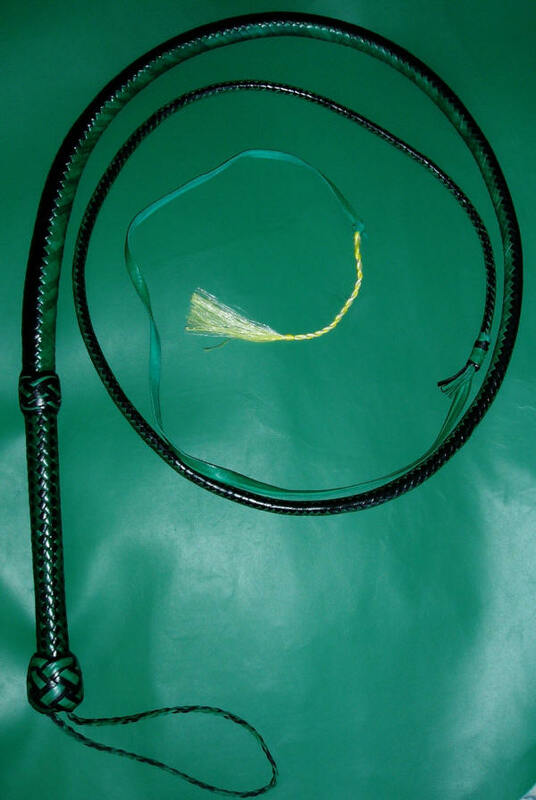 The most popular is 8ft, 12plait in Natural colour like the one below. 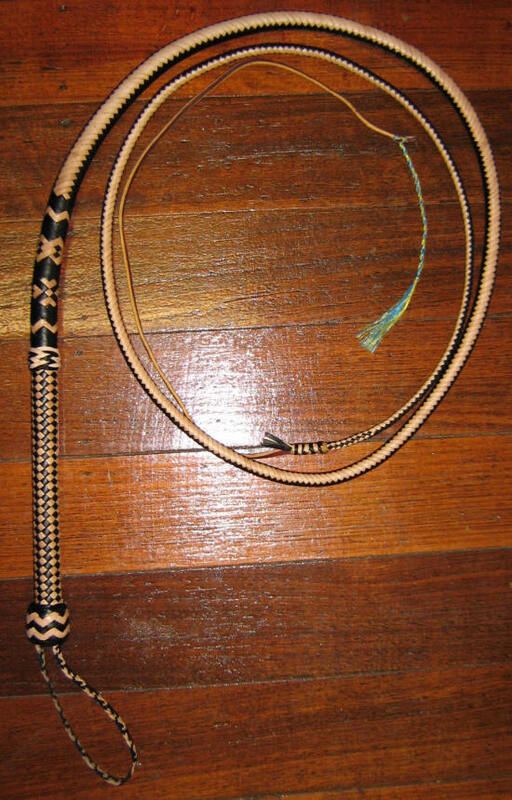 The latest movie used a 10ft, 12plait bullwhip that is Whisky in colour the knots are also different. If you prefer the new design please ask for a KOTCS Indy Replica. The first two pictures below are a replica of Indy 1,2 & 3. The second two pictures are a replica of Indy 4. 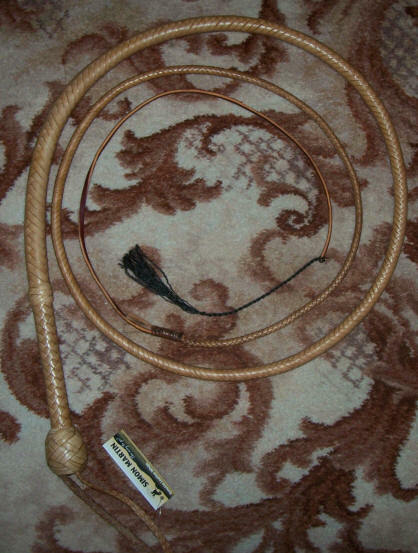 Prices are the same as the traditional bullwhips above.